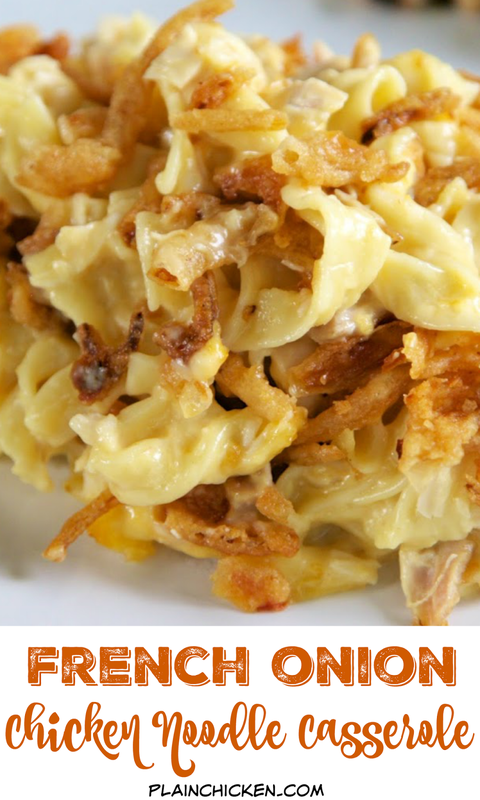 French Onion Chicken Noodle Casserole Recipe - egg noodles, french onion dip, cream of chicken soup, cheese, chicken topped with French fried onions - LOVE this casserole! Can make ahead and freezer for later. You can even split it between two foil pans - one for now and one for the freezer. Super easy main dish with only 6 ingredients that tastes great! Everyone RAVES about this casserole! One of our new favorites is the French Onion Potato Casserole I made a few months ago. It is SO delicious. I make it all the time. I started thinking about what else I could use french onion dip in and thought about this chicken noodle casserole. I have a "Cracked Out" version that is crazy good, so I substituted the crack flavors for the french onion dip. To up the onion flavor, I topped the casserole with a can of fried onions. This was SO good. We ate this for dinner and leftover for lunch a few days. This would also be a good freezer meal. Just mix up the casserole and pop in the freezer until you are ready to serve it. Let the casserole thaw in the fridge all day. If it is still frozen when you are ready to bake, add about 15 minutes to the baking time. Combine chicken, soup, dip, and cheese. Stir in cooked egg noodles. Pour mixture into prepared pan. 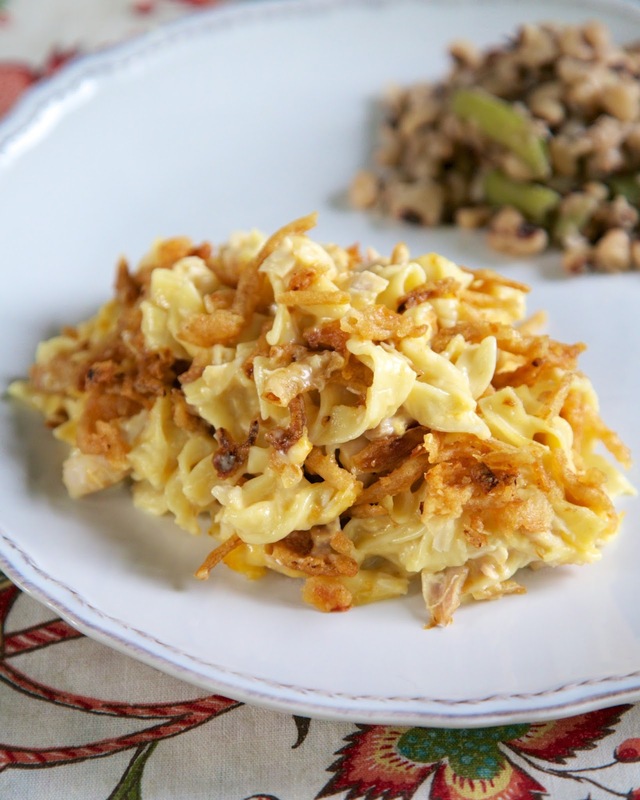 Top with crushed french fried onions. Top w Fritos OR French onions?!? I am glad to see others use french onion dip in casseroles…going to have to start using the french onion fries on top…yum! It came out really well. The french fried onions on top gave a nice flavor. I think I will add a can of mushrooms next time. Two cans of Cream of Chicken? What size cans? This recipe uses the French onion dip - so use the sour cream and the mix. I use Kraft french onion dip. I used the container version--already a dip. The recipe does not state what size of cream of chicken soup to use! Two cans of what size??? 10 1/2 ounce size. Unless a recipe specifically says a size, I always go with the regular can size. Just wanted you to know, I made this last night and it was sooo good!! Thanks for the recipe, everyone loved it and it's dinner again tonight! My mom made this a few nights ago. Very delish. I wonder if you can use other kind of cheese. This is on the menu plan for this week. I have the French Onion Dip with Bacon on hand, and no cheddar cheese so planning on Monteray Jack instead. Can't wait till Thursday to make it :) And I use canned chicken all the time but live in an area where the Grabill County Meats are readily available so use that brand. I ran across this on Pinterest, and you made me stop in my tracks and lick my lips. Then I almost licked the screen. Just kidding (kind of). Oh thank you for this recipe. I have been wondering what was for supper tonight. This is it! Sounds so yummy! this was delicious, thanks so much! served w a side of peas. Thanks so much for this recipe! My family really enjoyed it. I made a video of how I put this together for my YouTube channel. Could you prepare this ahead of time and freeze before baking? In the description before the recipe itself it says you can freeze. I was wondering if it would be weird to use rotisserie chicken for this. I always use rotisserie chicken. Always comes out wonderfully. Wow! This was really good! Thanks so much for sharing this recipe! It was a huge hit in our household! Can this be made as a freezer meal? It sounds delicious and I would love to add it to our menu for when baby comes. Any advice would be helpful! Thanks!! I think it would be fine to freeze it. What is the side you served with this recipe in the picture? It is just a side of field peas. Can you make day before and refrigerate? Are the noodles boiled before you bake? I haven't seen that listed anywhere in the recipe? It is the first line of the directions - you cook them according to the package directions and drain them. I made it with roasted broccoli. The next day, I heated the casserole and broccoli together and mixed it up....delicious!!! I made this and LOVED it! I would like to take it to a pot luck. Do you think its possible to make in the crock pot? I think it would be fine cooked in the crock pot. This is so good! Served w side of sweet peas. Delish! I used these crazy looking Italian Trottole pasta and added broccoli and sliced carrots. Yummy in your tummy! Sure! You can even cook it without any topping. Enjoy! Do you think this would work with a different topping, like crushed crackers? I don't have french fried onions on hand. Sure! Crackers, cornflakes - or you could even cook it without any topping. Enjoy! Made this tonight and it was excellent. It made a lot so I made two 8X8 dishes and put one in the freezer. I added extra cheddar cheese on top before I put on the french fried onions. This one is a keeper for sure!! Wondering if anyone tried this with leftover ham instead of the chicken? I discovered this recipe on Pinterest several months ago and it is now on my favorites list! 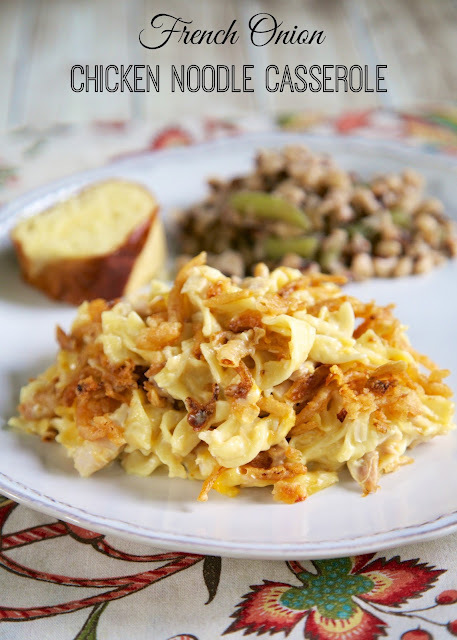 The onion dip is a great addition to many casseroles! Like Dean`s French Onion Dip in the Frig section? Not familiar with the packet kind?? Since you mix it with Sour Cream, it should be. That`s my hubby`s fave! Yes - the sour cream dip in the refrigerator section. Enjoy! how many pounds of chicken should I buy? Has anyone ever made this and frozen it? I have been cooking for a family in need and its easiest to provide several frozen meals. Just wondering if it will reheat well. Also aprox how many chicken breasts is 4 cups? Any idea how many calories for what size serving? It is VERY yummy, just trying to log it in my food diary. What is a serving size and how many calories would that be? My family LOVED it, but I am trying to log it in my food diary. Made this last night & it was sooo good!! Does anyone know how well it reheats? Thinking about reheating it in the oven so the onions don't go soggy on me. PS - we made it according to directions & had way more than 10 servings. VERY filling, but oh so delicious!! Do you freeze before baking or after. How long do you cook when frozen? My husband and I love this recipe. I accidentally bought the fried jalepenos instead of the fried onions the first time I made it, but decided it was a nice touch lol. It's delicious if you like spicy foods. I Love this recipe! I also mix a bag of vegetable medley in there , it is delicious! Absolutely delicious. I cooked the chicken with salt, pepper, Tony's seasoning and a little bit of cayenne. Then I deglazed the pan with some white wine (all I had on hand was a little Moscato). Then I mixed that sauce in with the mixture before I put it in the casserole dish and I think that kind of put it over the top. Absolutely delicious. I cooked the chicken with salt, pepper, Tony's seasoning, and a little bit of cayenne. Then I deglazed the pan I cooked the chicken in with some white wine (I just had a little Moscato). Then I mixed that sauce in before I put it in the casserole dish and I think that kind of put it over the top. The French Onion Dip seemed a rather strange ingredient, but it really added zip to this dish. I split it into two pans and baked one and froze one. Easy and yummy. I'll make this again. Just the hubs and I, I'm making this tonight for the first time, but cutting the recipe in half. Using rotisserie chicken and very excited to see how this turns out!!! I wasn’t too sure about this dish at first but the end result was delicious! My kids loved it and because of that this recipe is a keeper. I made it just like it said in the recipe, no substitutions or add ins and it was perfect! Thank you! SO glad you enjoyed it!!! We haven't had this in a while. It is on the menu for this coming week. YUM! Super Yummy! It was a hit with everyone except the grandbaby....but what does he know....lol. Definitely will be put on the regular dinner request list. Made it exactly how the recipe said. Love trying something different and this one did not disappoint! Thank you for sharing! Would ranch dip work instead of onion? Can you freeze this? Like a freezer meal and bake later? Stephanie, we love this recipe! A group of women and I are putting together a cookbook for our church. I was wondering if I could include this recipe if I have a citation of where it came from? Thanks!